London, Matthiessen Fine Art, A selection of French Paintings 1700-1840, June 6-July 28, 1989, no. 1. A prolific painter of religious subjects and much admired for his work in Fresco, Bon Boullogne also painted many mythological subjects. The absence of securely dated paintings by him has made it difficult to establish a firm chronology for his work. On comparison with The Triumph of Amphitritis, Musée Magnin, Dijon, and The Toilet of Venus, Sans-Souci, Potsdam, both dated by Schnapper to circa 1700-5 (see A. Schnapper, 'Plaidoyer pour un absent, Bon Boullogne (1649-1717)' in Revue de l'Art, 40-41, 1978, pp. 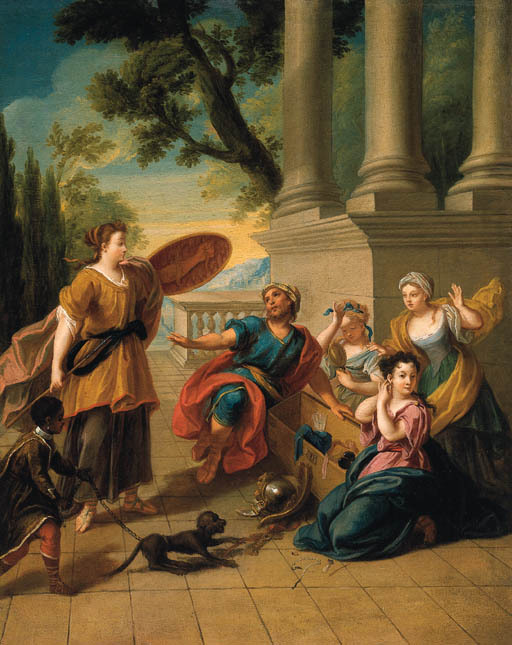 121-140), the present work, which reflects the closer association of Bon and his brother Louis at the end of the 17th century, can be dated to circa 1690-1700.